Phyllis Rowland, Wichita, Kansas, wrote that each family at the Wilson/Leverich Family Reunion received one quilt block for each member. They sewed the blocks before the reunion and tied at the reunion. 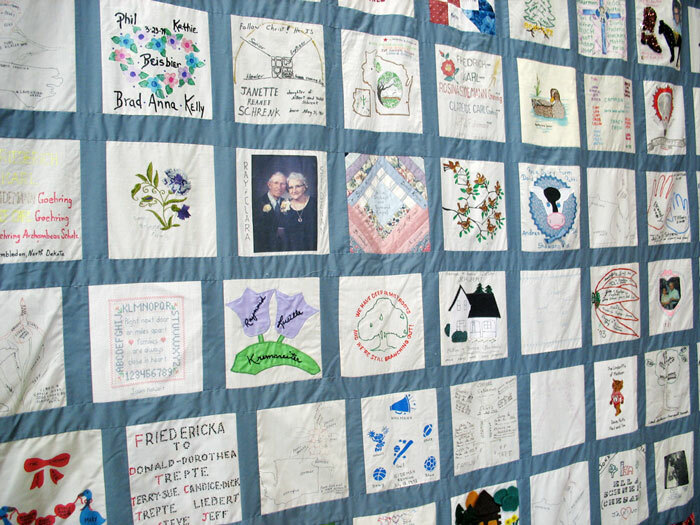 The quilt includes about 500 names, all descendants of their grandparents, who were married in 1893 and whose very first home together was a dugout on their homestead. The quilt will go to some lucky cousin whose name is drawn. 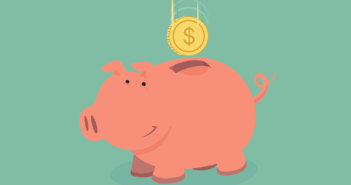 According to Patricia Hardcastle, Pocatello, Idaho, the highlight of the Jeppson Family Reunion is an auction of many items, none more treasured than Grandma’s jean quilt, which often raises $1,000 for the family fund. From a story in the Des Moines Register, Des Moines, Iowa,Joanne Boeckman, wrote about the Harmelink family quilt and said, “Besides holding so much symbolism, the quilt is indeed beautiful. 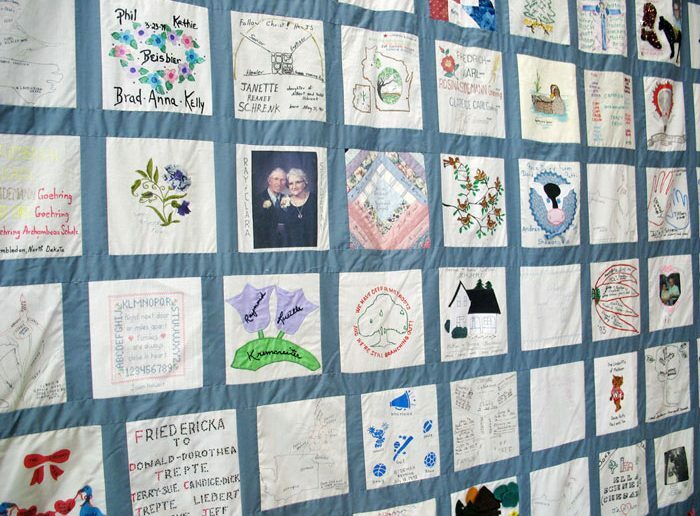 Laden with symbols of Harmelink Dutch history, the quilt was raffled and added nearly $900 to the reunion account. 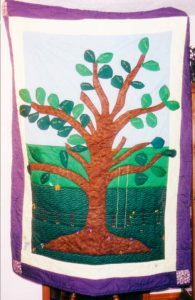 The quilt was designed by Betty Dorsman, Joan Goetch and Carol Petty. “Joan and I designed the quilt, Dorsman said. “She sewed it in Iowa, I in Arizona, then we sent it to Carol in Montana and she quilted it. 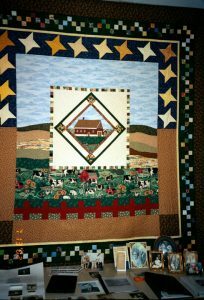 The quilt was adorned with several symbols representing the family, including a Dutch barn with the name Harmelink painted in the dormer, tulips, the four verses of “Blest Be the Tie That Binds, rolling hills to represent those of Wisconsin and Iowa where their forefathers settled, and stars. 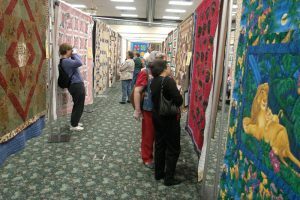 Peggy Moore, Mocksville, North Carolina, of the Campbell/Wilson Family Reunion, wrote that two members are quilters and they raffled a quilted Christmas wall hanging made by a cousin and raised quite a lot of money. “I made a Family Heritage Quilt showing all 12 of my Dad’s brothers and sisters, his mother and father, the log house they were all born in, a photo of the razing of the first church they attended, the one-room school they all attended, information and stories about those buildings and our family reunion theme (Love Keeps this Family Together). We used photo transfer, a process used to put photos onto fabric. It can be done with a computer and printer. My family really loves it and I display it every year at the reunion. September was hot and muggy in the piney woods of Northeast Texas. Despite the heat I was driving an unfamiliar county road searching for a particular driveway when I spotted an opening in the fence. I asked my husband, Donnie, to stop so I could check it out. My brother, Bruce, joined me as we trespassed to satisfy our speculation that this might be the place where 40 years earlier I’d chased fireflies along the driveway to my paternal grandparents’ home north of Bagwell, Texas. Bare feet of numerous cousins doused with dust from running and jumping the ruts made during rainy season had long since been washed clean. Still, memories came flooding back as I pushed my way through the summer’s growth of weeds taller than my head. “This is it! I told Bruce, surprised I could find it after all these years. For a few moments I was lost in thoughts of why I had taken so long to return to this place. Bruce and I plunged through the last tall weeds and into the clearing our grandparents had called home. Granddad’s wild roses were still growing along a former fencerow. Remnants of lives lived in our memories were segregated from those which had been added after 1959 when a stroke snatched Granddad away and Grandma moved to town. Most Palmer Family Reunions were in parks or recreational areas, with camping and boating, but held no personal attraction for me. I attended only two since the 1970s. This trek down memory lane was prompted when I was told by a cousin that ‘they’ decided at a family reunion to pass hosting around and my turn had arrived. 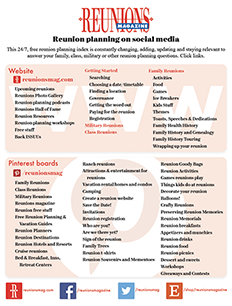 The pressure to host the reunion prompted this desire to go back to where it all began … back home to Bagwell. Donnie, Bruce and I drove into Bagwell to check on facilities where the family could meet for a day. Most of the old town was gone, but the little Bagwell First Baptist Church Granddad attended was still presenting the gospel each Sunday. We found a small community center and booked it and thus my plans began. I sent e-mails to cousins, collecting current addresses and hoping to ignite enthusiasm. I sent invitations in January announcing the date, place and, that I was making a family tree quilt to auction to pay for renting the center. I received some e-mails, but not nearly as many as I’d hoped. My Grandmother taught me to piece quilts. I embarked on the project inspired by the memory of her hand-pieced feed sack fabric nine-patches. I did a free-hand quilt design using taped-together newspapers as a pattern. It featured the exposed roots of a large tree, which would bear the names of our great-grandparents and their siblings, the trunk bore the names of our grandparents and their wedding date, and each branch represented a child. Beginning in 1911 the first 10 children were born about two years apart, then the youngest, Jessie Lee, was born about 10 years after my Dad. Along with the names were their birth and death dates. Two are still alive. Each of the branches bore leaves on which I placed names of my first cousins. The children who died in childhood appeared as pruned branches. Combining several media–embroidery, appliqué and fabric painting–I designed a meadow scene in which the tree was the prominent feature. When May 30th arrived, I wondered who would come and if they would enjoy being in Bagwell. I fretted that a simple building situated on an old school yard would bore those who enjoyed the lake atmosphere. Cousins began to arrive by 9:30 AM bearing lots of food, drinks and photos. Some young people had to introduce themselves and make their family connections for me. Children and grandchildren of cousins who had died or whom I’d not seen in years were alive with questions prompted by old photos of their parents and grandparents. A few thousand hugs later and not nearly enough time to catch up with everyone’s lives, a head count indicated it was the best-attended reunion in many years. The wife of the eldest cousin, as has been her custom, brought handmade gifts for the oldest, youngest and the one who traveled the most miles to attend. The quilt? A cousin who traveled from Michigan volunteered to auction it to the highest bidder. It quickly narrowed to two bidders each determined to buy it. 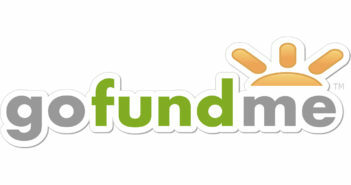 The final bid of $300 was more than enough to pay expenses for this and the next reunion. The eldest granddaughter of 36 grandchildren of Will and Ella Palmer said she had already cleared a place in her house for the quilt and was willing to outbid anyone who chose to challenge her for it. She outbid by $20. A favorite treat was a trip out to our grandparent’s acreage. Like Bruce and I, they may have wanted to hear again the clearing of our childhood voices with their heart and embrace the spirit of our grandparents. It was a great time to do that, just when a few latent blooms still clung to Granddad’s wild roses. Glenda Palmer-Kuhn is a former newspaper editor and has written numerous newsletter and magazine articles. 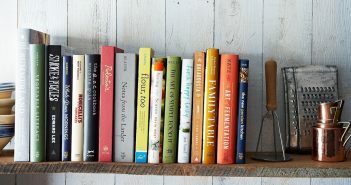 She has authored or co-authored five books. She lives in McLoud, Oklahoma, with Donnie Kuhn, her husband of 30 years.